A biography of the comparatively unheralded sister closest in age to John F. Kennedy strains to find something new to say about the Kennedy clan. How this book was written might be more interesting than the actual contents, as Leaming apparently stumbled across her story while researching more substantial biographies (Churchill Defiant, 2010, etc.). The framing sustains some suspense, as the book begins with an unnamed source whose identity isn’t revealed until the final pages. In between, Leaming chronicles a changing Britain through World War II and its immediate aftermath, as the country’s mood changed from isolationism and appeasement—in line with the position favored by Ambassador Joseph Kennedy—to a patriotic engagement with the Nazis, which found many sons of the British aristocracy serving and dying in the war, to an aftermath that saw both Churchill and the aristocracy challenged by a populist surge. 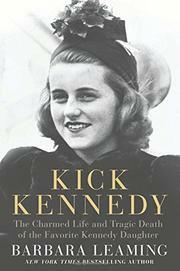 Amid all this is a love story that wouldn’t fill a book if it didn’t involve the Kennedys. Leaming mainly examines the romance between a feisty debutante and Billy Cavendish, heir to a prestigious dukedom. Marrying Billy would give Kick an identity, wealth, and power independent of her family, but it would also mean crossing her family by marrying outside the Catholic Church. True love weathered those challenges, but the war ended Billy’s life a month after they wed, with Kick in America (to the displeasure of her new British family) mourning the recent death of her brother in the war. Should Kick remarry, as Billy prophetically advised? Will she retain her British ties or return to live in the States? While the young widow tried to figure out her life without becoming a duchess (a future she seemed to miss as much or more than her late husband), she made a surprising choice that would further alienate her family and result in her early death. Leaming doesn't present much new for Kennedy buffs, but the age of Downton Abbey offers fresh context for this story of American royalty and its more tradition-minded British counterpart.